I drive for an LTL company based in Portland Oregon. I've been at this job since December of 2013. This job is very challenging and I enjoy it. 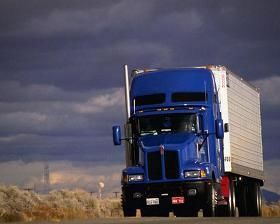 TT CDL Training Program - How close are the questions to the permit test? I just added the doubles & triples endorsement in Oregon. The High Road practice tests made this very easy. It looks like Paul W. dropped his trailer and bob tailed out for dinner.....not C. S.
Any drivers have experience with May Trucking? I went through training with May about 2 1/2 years ago right out of truck school. It was a 6 week program and it was excellent. The trainer sat next to me while I drove and coached me. Every day we reviewed how the day went and planned for our next day. I still couldn't back the truck into the dock very well when I completed training, but that's a challenge for most new drivers. When training was complete I left May for a local driving job, which I still have. I just could not handle living in a truck. Just sent another you another one. Daniel B. I'm sending you a private message. Thanks got the update. That's going to be one warm house! I'm anxious to here how your adventure with Tyson is going. We haven't heard from you lately. Did you finish your remodeling project? Have you started the new job? It looks like you had a blast out on the river. I've spent quite a bit of time in the Roseburg area and it's a great place, especially during the summer! It sounds like you've got a great trainer. Enjoy the rest of your training. Regarding old post, follow up to-NEED ADVISE!!!!! Made to drive while sick and dangerous conditions. Driving isn't for everyone. It sounds like you've had an opportunity to train with 3 different trainers. You still aren't comfortable, so perhaps it's time to move on? On a previous post Bud A. made a post of a student killing himself and his trainer while driving on Donners Pass. It could be a disaster if you somehow got out on the road without having the necessary skills to operate that truck safely. Whatever you do....stay safe! I hope this is a joke. Your previous posts about this seemed to indicate you weren't interested in making money and we're basically driving as a hobby. Didn't they ask you to actually start working, so you just quit? I don't recall you staying that you were threatened.....did you? That video is a hard to watch, but it could save lives as an example of what not to do. I've shown it to several drivers I work with. If your trainer doesn't understand your concerns I'd show it to him too. Good luck. I've been thinking about this thread since I watched that video Bud A. posted. Can you give us an update Carl? I'm hoping things in that truck are getting safer. People need to remember one simple rule......"if it sounds to good to be true it probably is"! My company pays some of our routes by the load instead of the hour like most of them are. We seem to constantly be looking for drivers for these routes. You are right. I am a local company driver. I read the forum regularly and this does interest me. I feel bad for the driver I talked to, because he's obviously in a tough situation. I just tried to share what he told me. I agree with you. The more I talked to this driver the more I felt he was trapped in his truck! I spoke with a lease operator this morning at a rest area near Canby Oregon. I asked him why he leases his truck. He stated the reasons commonly given on this forum: freedom to chose routes, fuel stops, his loads, drive ungoverned and increased home time. As we talked he said these freedom's actually cost him money and he was actually spending less time at home in Oregon because it was getting more difficult to get good paying loads back into southern Oregon where he lives. He said he has a friend who does most of his driving in the Midwest and flies back to Oregon every 6-8 weeks for home time and he's considering doing the same thing because the pay is better in the Midwest. I asked him if he would consider being a company driver again and he said he would if he could find something local, but he wasn't ready to give up his dream of owning his own truck yet. He said he's been driving 7 years, the last 3 leasing. I enjoyed the chat and wished him well as we parted ways. As a local driver I do everything I can to avoid calling dispatch. I get my pickup & delivery information through the phone (my QC ) and feel good about not speaking to dispatch all day. If I have questions I call another driver first. You ask for opinions and the consensus is to use your QC as much as possible and avoid calling dispatch. If you do have a problem with dispatch or any other person I recommend you "kill them with kindness". The most compelling reasons I'm hearing to lease is the freedom it gives a person, not the profit it brings. Companies are probably putting these restrictions on drivers to make more profit. If it wasn't good for the companies to have these lease programs I don't think they'd have them. How hard is it to find local truck driving jobs vs long haul? Driving locally can be brutal. I know Old School is just trying to ensure that drivers don't get into it over their heads. I enjoy driving locally....it's all I've ever done, but I honestly do not know how I survived my first year without a major accident. I drive out of Portland Oregon. Finding a local job is much easier than keeping it. If you can drive in close quarters and back the truck into tight spaces without wrecking you can keep the job. If you can't you can easily ruin your career. I never tell anyone what to do and local driving options are there, but as Brett has pointed out they are very tough for inexperienced drivers.